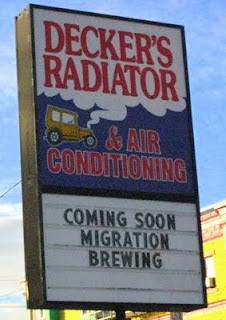 My eagle-eyed neighbor Lindsey spotted signage for a new brewpub near NE 28th and Glisan: Migration Brewing. That will make quite a little beer district there, with Spints Ale House going in around the corner at 28th and Flanders, and Coalition Brewing (née Hobo Brewing) at 28th and Ankeny. Pretty soon you'll be able to do an alphabetical pub crawl up 28th. Coalition at Ankeny, Holman's at Burnside, Beulahland at Couch, we need stuff at Davis and Everett, then there's Spints at Flanders and Migration at Glisan. By the way, Beulahland escaped my attention until a few weeks ago, but it's a worthy bar for us snobby types -- ten decent taps and even a cask engine (!). They also do their own house-infused vodkas and bourbons, if you're sometimes tempted by the hard stuff. The Linked-In page for Migration mentions a couple connections with the Lucky Lab, which gives me a good feeling about the place. 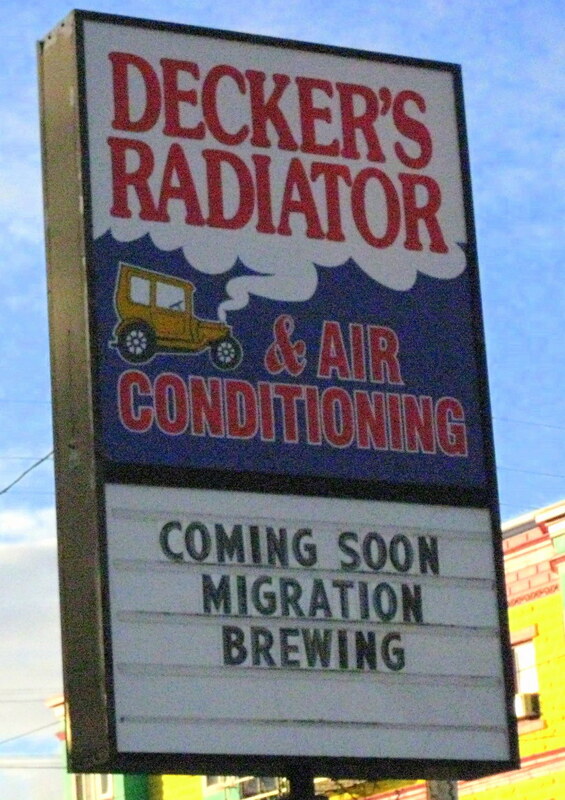 They're hoping to open in January. I'll put up more information if it comes to me. Wow. I wish we were getting that kind of brew pub love down here in Eugene. Save for Hop Valley Brewing that opened earlier this year, the only pubs that brew on site are a trio of McMenamins and Steelhead. Perhaps we need to arrange a pubcraw night. Although given the density of bars in some areas, crawling might not even be necessary; just lean into the next bar.